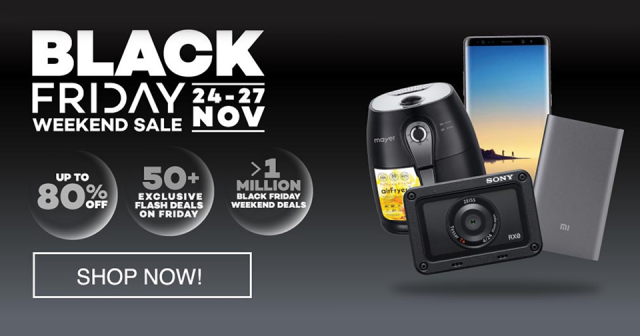 The Black Friday craze has penetrated the Singaporean market as we saw consumers flood into retail shops to grab the best deals. While many flooded physical stores, a significant number of shoppers found it much more convenient to obtain products online. This was evident as we looked into the number of Google searches for top e-commerce players and their deals. To ascertain which e-commerce was most searched by Singaporeans, we utilised Google Trends and found the following insights. Amazon & Lazada fought head to head through Black Friday however, Amazon claimed the overall top spot in Google with the highest average search interest. 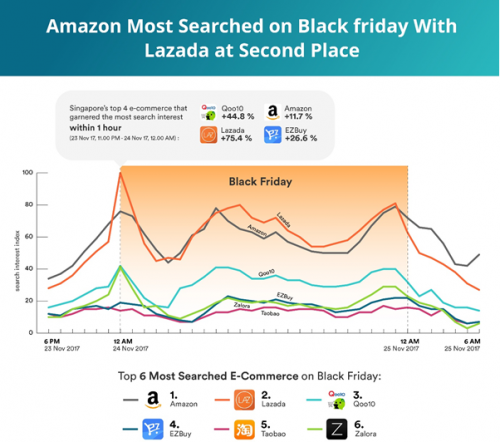 Though Amazon was most searched amongst Singaporeans on Black Friday, Lazada generated the highest search interest when the clock struck 12:00am on Black Friday. Although the sale began on a conventional working day, that did not stop consumers from shopping at 12:00am onwards. 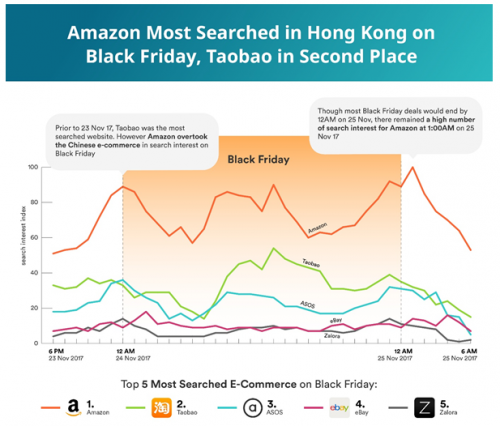 Prior Black Friday, EZBuy and Taobao were second and third runners up in search interest. However, Zalora leapfrogged both e-commerce on Black Friday as its garnered more search interest on Google probably due to its successful promotional initiatives. Various research and survey has revealed that Hong Kong consumers prefer to shop in physical stores on regular basis. However, consumers were more likely to shop online when during sale periods such as the recent Singles’ Day and this was true on Black Friday as well. The rationale is simple, it is convenient and does not require shoppers to wait in long lines. From the retailers’ point of view, it’s the best way to market niche products to consumers who have specific needs. Amazon was searched by consumers as it made available products and deals that is mostly unavailable in local physical stores. Part of Amazon’s success in Hong Kong was due to its diverse inhabitants that includes more than 330,000 expats that goes online to obtain products from their home country. Adding to this point, we saw a high number of search interest for Amazon at 1:00am (on 25 November) as consumers were still searching for the best deals from the US. Assessing the most searched fashion e-commerce, ASOS was the most popular fashion website during Black Friday and garnered the most search interest when compared to competitors such as Zalora, Sephora and Yoox. iPrice Group is a meta-search website where Hong Kong consumers can easily compare prices, specs and discover products with hundreds of local and regional merchants. iPrice’s meta-search platform is also available in six other countries across Southeast Asia namely in; Singapore, Indonesia, Malaysia, Thailand, The Philippines and Vietnam. Currently, iPrice compares and catalogues more than 100 million products and receives more than five million monthly visits across the region.